Printcious is an online gift shop for everyone to customise their special & memorable gifts for men & women during gift giving occasions such as birthday, wedding etc. Malaysia (EN), Malaysia (BM), Singapore, Australia, New Zealand, Hong Kong, Philippines, Taiwan, USA, Canada, Qatar, Kuwait, Turkey, Saudi Arabia, UAE, Egypt, and more. Visit MyBulkPrint.com for better deal! 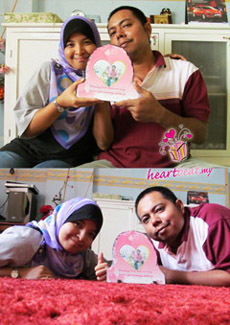 Terima kasih HeartBeat kerana menghasilkan hadiah kenangan UNIK sempena Ulangtahun kedua perkahwinan kami yang akan dikenang sepanjang masa bukan sahaja kepada kami berdua malahan kepada anak cucu kami nanti dan juga kepada seluruh ahli keluarga dan sahabat handai. 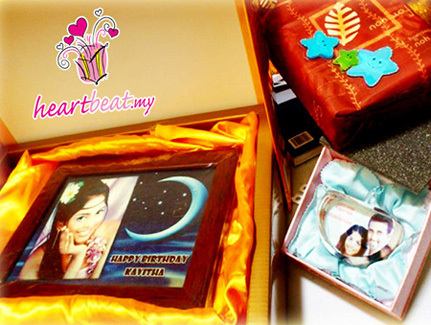 Photo Rock Big Door Shaped antara hadiah terbaik pernah kami miliki, ianya besar, cantik, teguh dan kukuh. Terima kasih sekali lagi kepada HeartBeat kerana menjadikan Ulangtahun Perkahwinan kami lebih bermakna dengan hadiah ini. I was looking for a valentine gift for my boyfriend and found out about HeartBeat through search engine. 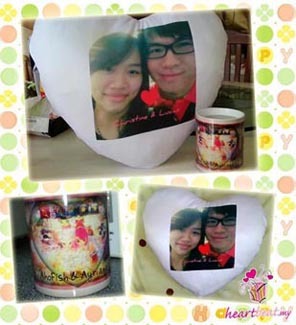 At first glance, I was excited with the variety of gifts available and got even more thrilled when I knew I could customize the goods with my own picture on it. I got my goods delivered within 3 days, less than 2 days actually. I was excited about how it will turned out and how it will look like in real. And to my expectation, the silk love cushion was cute. :D And the magic mug on the other hand, I loved it very much. Earn Extra Income WITHOUT Investing Any Printing Machines! Don't miss the gift seasons such as Parent Days, Valentine, Xmas etc in 2014! Enjoy making money with dropshipping. How Our Partnership Plan works? Join Us Today & Get Free Starter Kits (bunting, leaflet, catalog, PSD templates etc...) Worth RM200! Interested? If yes, please Click here for details. Gift Shop Owner, Florist, Wedding Agency, Photography Studio, Student Are Welcomed.